Before we start with this article, you should know that our nails are a very important part of our body! Why – because our nails can carry symptoms of many diseases, including cancer. But, you shouldn’t be worried, because we’re not going to talk about symptoms or any diseases in this article! Can I ask you a simple question – does the name lunula rings any bell? 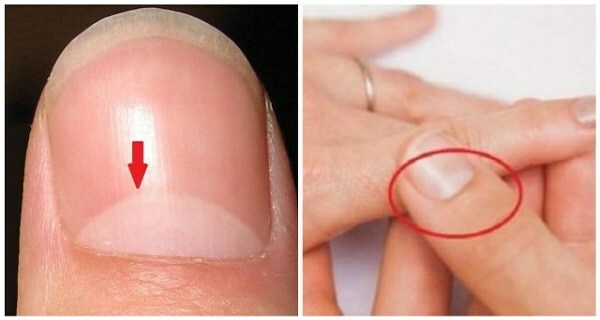 Have you noticed a crescent-shaped whitish area at the end of a fingernail? It isn’t just an area of pigment change under the nails; in fact, it is a highly sensitive area and you should make sure it doesn’t get damaged. 1. First you should know that the crescent-shaped whitish area of our fingernail, which the eye perceives as white crescent is very sensitive and extremely important part of the structure of the nail! As we said, you should be very careful and this part shouldn’t be damaged. 2. This half-moon part is called the lunula (small moon in Latin) and it’s a very sensitive part of the nail. 3. This part looks white, because is the fifth basal layer of the epidermis and it actually “hides” the blood vessels that are underneath. 4. It’s most visible on the thumb but not everyone’s lunula is visible. In some cases, the eponychium, the thickened layer of skin surrounding fingernails and toenails, may partially or completely cover the lunula. 5. The lunula is actually the visible part of the nail’s root and should not be damaged in any way because if you damage it your entire nail will be permanently deformed. 6. Many experts around the world think that the lunula can reveal some very important information about our overall health. For example, traditional Chinese medicine believes that a lack of lunula indicates anemia and malnutrition while a pale or bluish lunula indicates possible diabetes. If a person’s lunula has reddish smudges he or she may be suffering from cardiovascular diseases. 7. A lack of lunula or a really small lunula usually indicates indigestion which can happen due to slow metabolism and toxin overload in the body. 9. The normal fingernails should be ruddy, restrained, tough, arc-shaped, smooth and glossy with clear lunula which tells whether the person is energetic and healthy. The more energetic a person is, the whiter the lunula is; on the contrary, the lunula is poor and vague. 10. In general, the lunula takes an area of about one fifth of the fingernail and has the clear edge. The lunula usually tells the disease of a person in the form of color change or disappearing crescent. After the person regains the health from regulation, the little moon will gradually appear again. The less lunula a person has, the lower energy and poorer health and immunity he/she has, so it’s more likely for he/she to feel tired. If the lunula only appears on the thumbs, it indicates that the physical energy is insufficient and the disease is about to come.